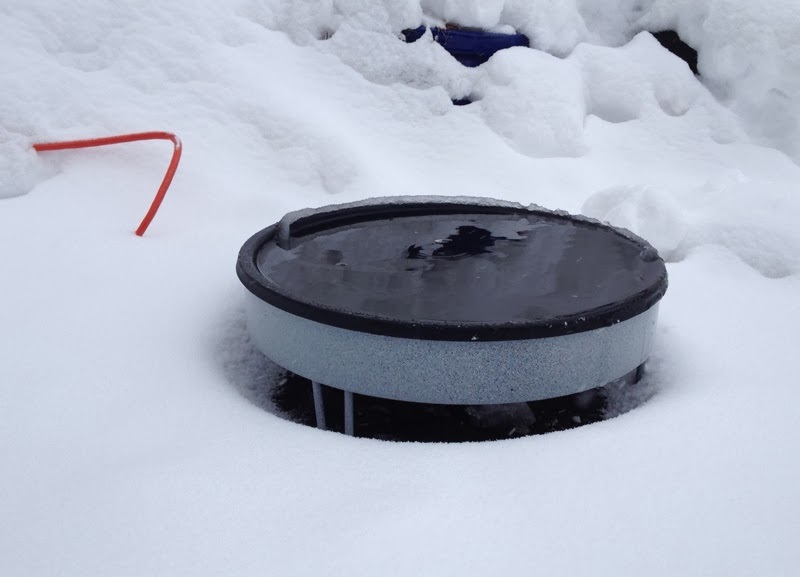 The Erva D14BH heated birdbath this morning before 10 inches of snow arrived. My new heated ground birdbath from Erva (D14BH) is really pulling its weight this winter. We've experienced several days (if not weeks) of below freezing temperatures and the birdbath has performed well. The birdbath apparently will keep water unfrozen with temperatures as low as -20 degrees Fahrenheit, but luckily it hasn't gotten that cold in Connecticut to test that claim! Why is it important to provide water to birds in the winter? Most bodies of water become frozen, and normal birdbaths without a heating element will often freeze. Birds get thirsty too. The bath is 14 inches in diameter so it accommodates large birds such as mourning doves fairly well. Other big fans of the birdbath are the neighborhood squirrels. It stands 5 inches off the ground which apparently is the optimal perching height for thirsty squirrels. On extra cold days, the birdbath's water will look as if it is steaming. This does not mean the temperature is too warm for the birds, but it does give it a nice hot tub look. According to Nature House, which manufactures the birdbath, "the thermostat is set to turn the unit on at 38 degrees Fahrenheit and off once it reaches 65 degrees Fahrenheit." Taken through the window halfway through today's storm. A white-throated sparrow decided to take a drink. I wish the cord connected to the bird bath was a bit longer; it is only 6 inches long. Eight or even 12 inches would have been helpful in placement purposes for the garden. I ended up buying a six foot outdoor extension cord so I could plug it in. I also purchased (separately) a cord shield that protects the two connecting power cords from rain, snow and other weather maladies. It's important to keep the birdbath filled with water. It will run without water, but it causes the plastic dish to bow and distort. (This happened once to me so far when I didn't refill it one morning when the water level looked low.) 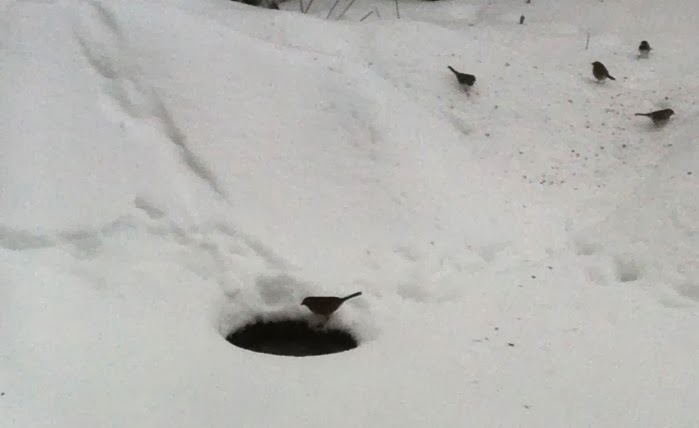 The birdbath still works well even when the snow gets too high, as seen in the photo from today. Sometimes icing will occur on the edges but it does not effect its performance. So far the birdbath has been easy to clean (it is made of resin). I just dump the water and refill it. It hasn't accumulated any birdbath "gunk" as other birdbaths typically do (this could also be due to the cold temperatures). The birdbath doesn't come cheap: it's $79.95 through Duncraft or $89.95 directly through Nature House. (I received mine as a Christmas present through Duncraft.) According to the manufacturer, the resin dish is made with a flame retardant material, which makes me feel better about leaving it unattended outside.